Detail: The most famous of all hanging furniture made for the kitchen, La Panetierre. One can only imagine the workmanship, craft and artistry it took to create this most coveted of Meubles Arts Populaires Provencaux. It is hard to believe in this day and age when lovers of French Country Provencal will do anything to find the few remaining authentic beauties, that this piece was used to guard and store bread for the following day. 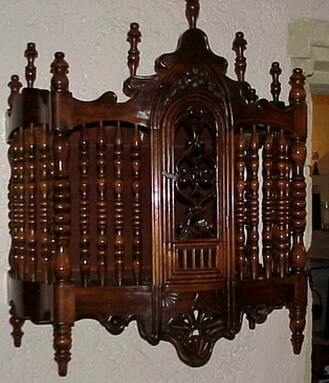 The piece is in the style of neo-gothic art-populaire of the 1800s in a beautiful classic Noyer (Walnut). 31"L x 17"W x 43"H. Photos, Price and all information for serious inquiries.